Curve NY was hot and steamy, but what else would you expect from the Big Apple in August? Aside from the soaring temperatures outside, the show was bustling with buyers from all over North America. It's always a great opportunity to meet with new and existing buyers of Eucalan and this year was extra special because my husband Ken attended the show with me. We haven't done a show together in years so it was a nice change. While in NY we were happy to be invited out to dinner with the ladies of Soho Publishing. Soho produces Vogue Knitting as well as Yarn Market News magazines, which we advertise in. 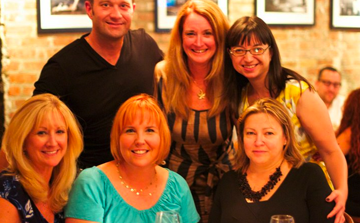 Dinner and drinks in the Meatpacking District + 5 gals + 1 guy = a great evening for everyone! Thanks ladies! We're looking forward to Curve NV in Las Vegas August 22-24 at the Venetian. We'll be sharing our knowledge of all things laundry in booth #351, but we're also looking forward to the hotly-anticipated SO CURVE SO SWIM Fashion Show at the Crazy Horse Paris at 7 PM August 22nd. See the latest designer swimwear modeled by the original Crazy Horse dance ensemble from Paris – this is no ordinary fashion show! Both the swimwear and the modeling promise to be a dazzling display, and we're proud to sponsor the event this year. Attendees can look forward to a Eucalan gift bag! If you are unable to attend, there are plenty of videos from previous shows on YouTube – they're worth checking out! I'm saddended to hear the news that FiberArts is ceasing publication; each issue was always filled with a wealth of knowledge spanning various fiber-related disciplines, and it was always an interesting and informative read. I feel fortunate to have been among the contributors during the magazine's 30-year reign. My collaboration with Danielle Webb (Wallflower Vintage/The Dress Shop), Lisa Carrow (instructor at The Waldorf School, my sister-in law and daughter of the founder of Eucalan) and Celia Love shared our collective knowledge when it comes to laundering delicate and vintage fabrics. Caring for Vintage Treasures (Jan/Feb 2010 issue) explained the benefits of hand-washing vs. dry-cleaning vintage items, sharing several case studies from Wallflower Vintage. Because traditional detergents and dry cleaning agents can strip the fibers of their naturally-occurring properties, we recommended products that enhanced these properties, such as Eucalan Delicate wash. It's important to use a liquid soap that doesn't require rinsing, but we also recommend looking for one that also contains beneficial essential oils such a eucalyptus or lavender, because they protect against moths and fleas. Check for color fastness on a small section of the garment prior to washing, and wash garments separately if their color bleeds or transfers to your cloth. Spritz stains in vintage linen with a blend of 1 quart water mixed with one-quarter cup white vinegar while the garment is exposed to sunlight. Handwash wool, cashmere, linen, rayon, chiffon, lace, velvet, leather and fur trim, and garments embellished with beading, sequins, and anything metallic. Use tepid water for handwashing, soak for 15 minutes, gently squeeze out garment and roll in a towel to remove excess moisture. Spritz needlepoint items with a mixture of delicate-wash liquid and water, then blot dry with a clean towel. 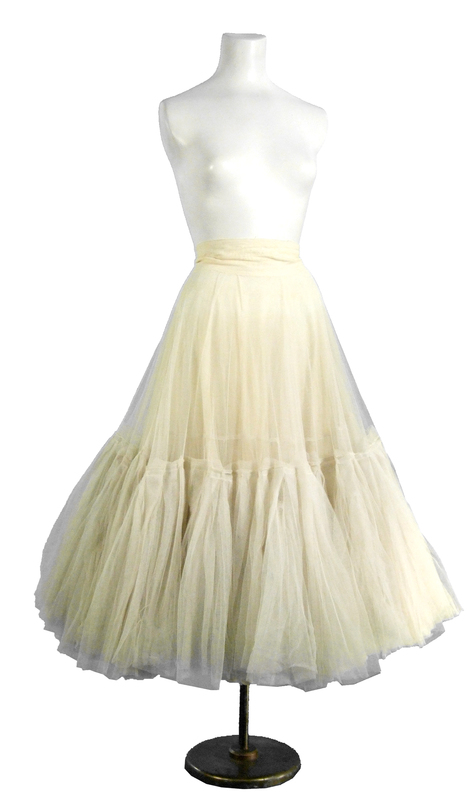 When this beautiful ball gown crinoline came to Wallflower Vintage it was positively gray, but otherwise in perfect condition. We bathed it in tepid water using 1/8 cup Eucalan delicate wash, letting it soak for 25 minutes. Then we gently squeezed the water out and the dirt literally fell out of the tulle; the water was very dark! We repeated the process and were extremely happy with the results, so it was hung to dry. After steaming, all of the layers fluffed up and the tulle is now quite soft and bouncy, ready for hours of dancing again! This classy 1950’s shirtwaist had underarm sweat stains and stains on the skirt of unknown origin when it arrived at Wallflower Vintage. The combination of chiffon over taffeta created a challenge as chiffon bunches up when wet, and taffeta shows watermarks when it’s spot cleaned. So, first the sweat marks and other stains were treated, and then the whole dress was soaked in Eucalan Delicate Wash (1Tbsp. in enough water to immerse the dress) for about 15 min. The water was then gently squeezed out and it was hung to dry. The dress steamed up beautifully both the taffeta and chiffon returning to its original look. The former owner of this turquoise, wool tweed winter coat must have run through some spring slush puddles. When we received it at Wallflower Vintage there were brownish splatter marks here and there. Thankfully cleaning was easy. Using a 1:1 solution of Eucalan Delicate Wash and water, we spot cleaned the marks and each one disappeared without leaving a watermark. The coat looks like new and is ready for the next winter season again! 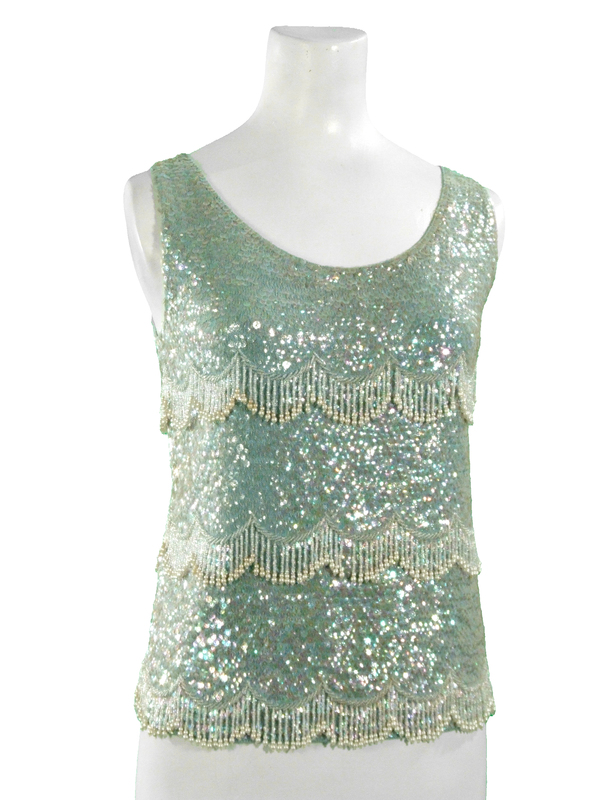 This spectacular sequined and beaded tank has a 100% wool knit foundation. When it arrived at Wallflower Vintage it was very grubby around the neckline and had lost its luster and sparkle. Using Eucalan Delicate Wash full strength we treated the neckline, gently rubbing it in with a soft cloth and allowing it to soak in for 15 min. Then we fully immersed the tank in a basin of cool water with 1 Tbsp. Eucalan, and soaked further. During this time – about 25 to 30 min., occasionally we gently massaged the top to ensure the solution fully penetrated. Very carefully the top was gathered up and spread out on a large towel and rolled to remove excess water. The top was then spread out on a clean, dry towel, blocked to the proper size where it was allowed to dry fully. We were thrilled to see it restored its clean and sparkly self. 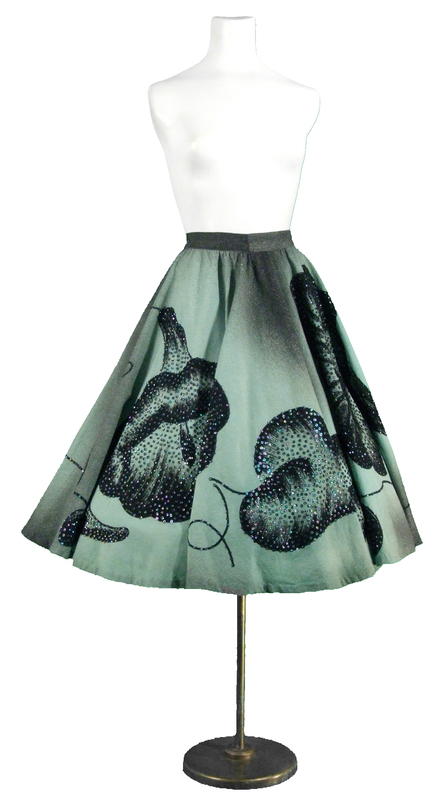 The Wallflower Vintage gals loved this amazing circle skirt from the 1950’s, and the sequins covering the floral motif raised a concern about cleaning the stains. The dark stains were treated with Eucalan Delicate Wash worked directly into the affected areas and allowed to sit for 15 to 20 min. Then, the entire skirt was soaked in cold water only, being 100% cotton, using 1 Tbsp. Eucalan. After gently squeezing out the water and hanging to damp dry, the skirt was ironed on the wrong side. We were thrilled with the results; no more stains, and the sequins are as sparkly as ever!